“Princess Vickie” has been sold…. I made “Princess Vickie” when I was first getting back into quilting a few years ago. She was pieced in 2007 and quilted in 2008. 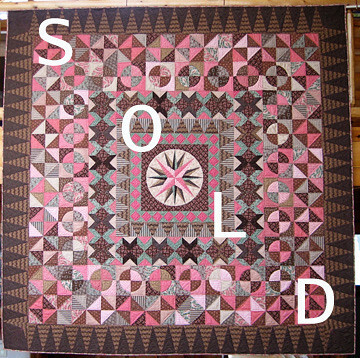 The quilt measures about 92″ x 92.” This was early in my long-arm quilting efforts. You can see that I did mostly straight line quilting with a few continuous curves thrown in. I used a variegated King Tut thread in shades of pink. The batting was Hobbs 100% cotton. Most of the fabrics are from the Marcus Brothers collection called “Charleston II.” The backing is a one piece wide backing from that line of fabrics as well. “Princess Vickie” won a third place ribbon in the Michigan Quilt Network (MQN) quilt show in 2008. The pattern appeared in Kaffe Fassett’s book entitled “Museum Quilts,” although I made a slight modification to the final border design. The antique quilt upon which Kaffe based his design resides in the Victoria and Albert Museum in London, England. Click here for a Flickr slide show with more pictures. This entry was posted in Princess Vickie, Quilting. Bookmark the permalink.